The extraction of mineral resources in the remote Ring of Fire represents a multibillion-dollar enterprise, potentially creating thousands of jobs throughout the North. The challenges are significant –but the boost to the North’s economy (and the province) may be worth the investment of public dollars on capital projects, such as a rail or road access. With comparisons being made between the Ring of Fire and Alberta’s oil sands, it’s no wonder that environmentalists and First Nations communities are wary of runaway development decisions being made by governments without due consideration of future impacts. While bitumen mining in northern Alberta has brought economic growth, it has also created significant social and environmental issues that will likely remain for centuries. To avoid similar negative impacts, a truly comprehensive and consultative environmental assessment process needs to be priority number one. However, until now, the Conservative government has seemed content to put itself at odds with environmental organizations and First Nations. As a result, the government has needlessly contributed to the delaying development in the Ring of Fire. 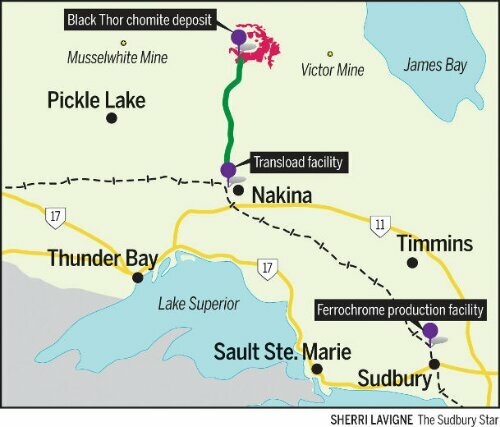 This entry was posted in Canada, economics, energy, environment, pollution and tagged bitumen, mining, Ontario, ring of fire, stakeholders, sudbury.